One afternoon in February, students Jordan Hambley and Jordan Wood-Spadafore were sitting on the stairs in front of their school waiting for the bus to arrive when they saw a younger student collapse in front of them. “I went up and asked him if he was okay, but he didn’t respond,” recalls Jordan H.
“As Jordan H. ran to the main office for help, I stayed by the boy’s side. I panicked, but I remembered my high school CPR class and knew I had to do something, so I put him in the recovery position and checked his vital signs,” shares Jordan W.
Teacher Kyle Gutscher, who was made aware of the incident quickly went to get his CPR trained colleague, Mr. Craig Flanagan. While the vice principal, Mr. Wilson called 911, Jordan H. returned with Mr.Flanagan. and the Lively District Secondary School principal, Ms. Leslie Mantle. The principal and the teacher quickly saw the boy had no vital signs and knew they had to start CPR. 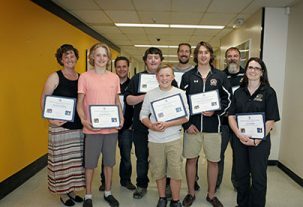 Brian Schouten, a Grade 12 student ran to get the school defibrillator. During that time, Dylan Brown, a Grade 8 student saw what was going on from the bus. “Dylan is a good friend of the boy, and he immediately wanted to help. He remembered that his friend Lucas Howlands’ mom, Charlene Howland was picking him up at school and that she was a nurse. So Dylan immediately sent a text to Lucas about what was happening,” says Ms. Mantle. When Lucas and Charlene saw the text, they immediately rushed to the scene. Working as a team, Charlene and Mr. Flanagan started performing chest compressions and artificial respiration on the young boy, while staff member Ms. Mathias helped guide by counting out loud. The boy started breathing shortly before the paramedics arrived. Today, the student is alive thanks to the team effort of so many that day. Each and every one of their actions played an integral role in the chain of survival that helped save the life of a student during a sudden cardiac arrest. “After this experience, I approached my physical education teacher and asked to have a CPR refresher course,” shares Jordan H. “Knowing CPR gave me the necessary confidence to take responsibility and react immediately,” he adds. “I have been teaching the ACT Foundation CPR and AED program since it was first introduced to the high school students. It is an amazing program and is one of the most beneficial, not to mention life saving skills that our Grade 9 students learn and take with them for the rest of their lives. I am very proud of our students for knowing how to react in an emergency situation and for using their learned skills from the ACT Program to help save a fellow student’s life,” says physical education teacher, Kimberly Chezzi. The ACT High School CPR and AED program was set up in Lively District Secondary School in partnership with lead community partner Vale and other community partners, provincial partners, the Government of Ontario, Hydro One and Ontario Trillium Foundation and ACT’s national health partners, AstraZeneca Canada, Pfizer Canada and Sanofi Canada. The Advanced Coronary Treatment (ACT) Foundation is an award-winning, national charitable organization dedicated to establishing free CPR and AED training programs in high schools across Canada. ACT raises funds to donate mannequins and teacher training to schools, and guides schools in program set-up and long-term sustainability. Over 3.2 million youth have been trained in CPR by their teachers through this lifesaving program to date.